This past week was quite the whirlwind! 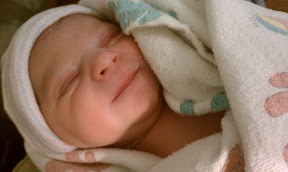 Mouse was born at 1:21 a.m. on March 9, 2011, weighing in at 6 lbs and 3.5 oz., 18 inches in length. Her father and I fell in love with her instantly. The last several days have been spent getting to know her and adjusting to parenthood. Very soon our house will be filled with grandparents and other visitors wanting to get to know Mouse as well. As a result, my attention to my blog will be minimal in the next few weeks. I do have one review ready for posting early next month and hope to at least check in on Sundays to let you know what I've been reading. In lesser news, Anjin and I got word this past week that the offer on a house we like has been accepted. We are busy working on getting that taken care of as well as making sure the city is doing their part (as they are buying our current home). If all goes well, we will be moving in a month or two. Anjin already has Mouse's room picked out. Please do stop in and say hello if you have a moment and let me know what you're reading! What a beautiful baby! Congratulations! I love that second photo- she looks like she's smiling. Wendy, I'm so happy for you and Anjin!! Congratulations on your beautiful baby girl! Such a joyful time. I remember it well even though my baby girl is 28 now and a L&D nurse helping other beautiful babies come into this world. Take care and enjoy! Big, big hugs to all of you! I am so happy everything is working out for you! That is one beautiful baby! Congratulations! She is such a pretty baby! No wonder you fell in love with her! Congratulations Wendy! Your daughter is just gorgeous. And it's great that your offer has been accepted; it will be wonderful to get settled in your new house. Fingers crossed it's smooth sailing from here! Glad to hear that things are going well with your housing situation, too. Hopefully all the rest of it will work itself out and you'll soon be settling into your new home! She's beautiful, Wendy. Congratulations to you and Anjin! Your little mouse is a doll! I'm so happy for you! Glad, too, that the house situation is ironing itself out. Enjoy getting to know your beautiful girl! She's a doll, Wendy - I can see why you are in love with her! And I am so happy to hear you have a house...this must be such a relief to you. In no time at all you'll be in your new home with your new daughter....life is good, yes? Welcome Mouse! You are a beautiful girl indeed. Congratulations to you and Anjin, Wendy! She's so pretty Wendy! Congratulations. What a beautiful little girl - congratulations! Awesome news... all the way around. Enjoy it all, even amid all the chaotic-ness. Oh, Wendy, she's beautiful!! Congratulations to you and Anjin! I'm so glad to hear things are coming together with the house, as well. Enjoy that baby! Look at that little smile! Congratulations to all in your household! It will be an exciting time! Wendy, Big time congrats to ALL of you. She is a beauty. Mouse is simply SPLENDID!!! I love her already..what an adorable face. I am so thrilled for you and Daddy!!! Enjoy this wonderful time getting to know each other!! Didn't Fanny Flagg write a book called Welcome to the World, Baby Girl. Welcome Mouse and congratulations to you, too. I say forget about your blog for a while and play with the baby. Congratulations! What a sweet face! I'd love to be able to kiss the top of her head! Oh, Wendy - she is absolutely gorgeous! And the nickname Mouse is perfect. I'm so very happy for you. Enjoy this time and don't worry about blogging - a new baby and a move on the horizon is plenty to think about! Congratulations!!!! She is beautiful! Adjusting to parenthood and a newborn takes time but before you know it, it will be like she has always been there :) Keep the pictures coming and good luck with everything! Congratulations!!! What a cutie! Enjoy your time with the new addition and come back to us when you can. Congratulations Wendy! Your daughter is beautiful. I wish you and your family the very best and look forward to future updates from you. Congratulations Wendy - such a beautiful little girl! And congrats on getting the house that you want. Yes, things do come together! What a beautiful little girl! I am so very pleased for you and your husband, and am wishing many happy days for you and your new little one! Congratulations, Wendy! I was thinking that it was about time that girly showed up! And she is absolutely gorgeous...she has a look on her face like she knows she is the luckiest little baby ever, to have parents like you and Anjin. And woo hoo on the house! Time to move onward and upward! She is beautiful! Many congratulations. Congrulations! She is gorgeous, and fantastic news about your house as well! Congratulations on your lovely baby. I'm reading Carol Shields' 'Unless', which is the first book of hers I've read. I can't get over that I haven't read anything by her until now -- I'm enjoying it so much. Congratulations to you and Anjin. Not only for your beautiful daughter but also for your house news! Such a beautiful little Mouse! Congratulations to you and Anjin! Boy you are one lucky kitty! A healthy and whole little mouse and you all get to live in a new little house!! Could you ask for more?!?! Revel in the newness and enjoy these moments. OMG!!! She is precious! With all you have going on, I am impressed you have time to read! Enjoy ever minute, she is going to grow so fast! To answer your question, I am reading Crimsons Room by Katherine McMahon. It is a good story but is not grabbing me. It is for my book group so I am going to stick with it and hope it gets better. I am listening to The One That I Want on audio. It is more enjoyable. I was watching the horrible footage from Japan all weekend and put myself in a real funk. I can't tell you how happy this post made me. Seeing a cute little baby will do that to you. Beautiful Mouse! Lucky Wendy and Anjin, and congratulations! She is so lovely. I'm so thrilled it went well, Wendy. Congrats on the house but especially on the baby. She is absolutely beautiful!! Oh Wendy, she is just beautiful. Congratulations and I'm just so happy for you both. I'm looking forward to hearing more about the little mouse. Great news on the house as well. Take care! Hugs! She is so pretty! Congratulations Wendy! So glad to hear you are well and yay too on the house stuff. Oh, Wendy, what an amazingly beautiful baby! All my congratulations to you and Anjin, and also about the house! What a blessed life, and I hope you continue to post pictures! Don't worry about us..take time to be with your family, we'll all be here when things settle down and you have time to pop-in. She is absolutely beautiful, Wendy - and smiling already! What a wonderful disposition and a real blessing for your family. Sweet pictures. I know what you mean. My granddaughter was born four weeks ago and my daughter's house is always full of people, including yours truely. I hadn't realized until now that she was born on my niece's birthday! If she grows up to be like my niece, she'll ber an amazing young woman. That second photo is absolutely one of the sweetest baby pictures I've ever seen. I envy you and Anjin and wish you much joy and happiness mixed with just enough rain to make the sunshine sweet! Oh, what a sweetie! Congratulations! Isn't it amazing how much you can love someone you just met? Congrats on the house--what a lot of changes in your life in a short period of time! She's a beautiful baby! Congratulations to you and Anjin! I'm so looking forward to more of Mouse's photos in the very near future. Happy Belated Birthday, Mouse! 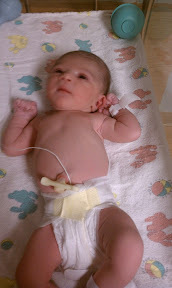 Congratulations Wendy and Anjin, she's beautiful! I'm so happy for you that everything is working out well and you have your special girl with yopu now. I hope the fur kids are behaving! I'm reading A History of Love by Nicole Krauss and Fury by Salman Rushdie. Oh, baby, what a beauty!! I'm so happy for you and Anjin. Congratulations! I said congrats on Twitter already but this is the first time I've had to chance to see her photo. Beautiful! She is such a darling. Congrats to you both. I'm very late to this, but I wanted to congratulate you on your new beauty! :) She is beautiful! Congrats! "My mother's Mouse, she loves me so/My father's Mouse, from head to toe..."
Congratulations, Wendy!!! And, welcome to the world, Baby Mouse! Welcome to the world, little Mouse! I love the expression on her face. I'm so happy for you all.